Narnia Lodging is set in Mediterranean Oak woodland 1km west of the village of Zafarraya, with all the amenities you will require. The casita has beautiful, uninterrupted views of the Sierra Tejedas and Maroma national park with it´s own private tree top terrace for alfresco dinning. During your stay at Narnia you can enjoy the jacuzzi in your private glade, the pool and slide, boules court and beautiful gardens, relax on the swing seat that gently sways in the breeze,or maybe enjoy a game of chess on one of the shaded terraces, or just relax on a sunbed. There are outside shower facilities, near the pool. The area is ideal for walking, cycling, painting, bird watching etc, we can arrange cycle hire and horse riding should you wish. All in all a stay at Narnia will give you a very relaxing holiday, whether you want to laze by the pool or be active, you only have to walk out of the front door. The Sierra Nevada resort is just 1.5 hrs away. Fabulous view. Helpful owner. Comfortable, well equipped casita. Relaxing garden. Surrounding area very scenic. Wonderful casita in the mountains! Thank you Alan for the week at Narnia. We enjoyed the beautiful view and daily visits from Django. The hot tub was a perfect place to end each day! The location is remote and offered a step up from camping. If you are looking for fast internet speeds or lots of action then this is not for you! But if you are looking for tranquility and a place to get away from it all, Narnia will deliver! 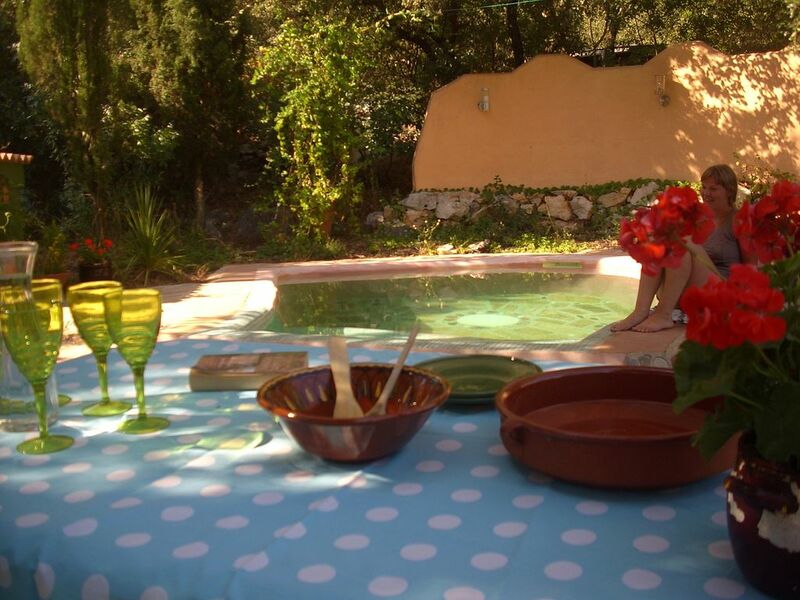 A great casita with a lovely terrace and friendly and helpful owners. The surrounding area, at this time of year, was full of wild flowers, butterflies and bird life. The nightingales singing in the garden were wonderful and we spotted a lot of typical mountain birds nearby. Plenty of scope for rambling and picnics. Just one small suggestion, we would have appreciated a small book with guidance re, local shops (location and opening times), restaurants, plus details of where to wash clothes etc. Our second stay at this lovely casita. Very comfortable and easy going, well equipped and so warm and cozy with the log burner. Logs provided by Alan plus lots of ideas on walking and the area. Lovely walk into town theough fields just waking up after Winter, a real Spanish feel, friendly people, great weekly market. Walking here is a delight. We walked for miles on the old railway line, great views, spring flowers, not many people - perfect. The whole area has so much to offer or you can just relax on the terrace and enjoy the views, birds, eagles too. Thank you Lyn and Alan, we will be back! Thank you for your wonderful review and for staying at Narnialodgings for the 2nd time. As you say walking is a delight around the area and beyond, next time you come we will advice you on some different walks that will give you spectacular views and wonderful nature along the way. Our stay was everything we hoped it would be - a peaceful getaway in the mountains and a taste of rural Spain. The Casita was perfect and had everything we needed. We both loved relaxing on the big, sunny terrace, enjoying the stunning views of the mountains. Alan and Lynn were friendly and helpful from our initial enquiry to leaving. I can't recommend this place enough. We loved our week in the casita. The views are amazing, the countryside is largely farmland in between the mountains. Everything is provided for a peaceful holiday in the woods with the sounds of wildlife including the bells from the goat herd. The house is very well equipped, comfortable and tastefully furnished. Don't be put off by the fact there are few reviews - the visitors book is packed with glowing reviews in the house. Thanks Alan! We can arrange, cycle hire, horse riding, walking guides, and motor bike guides and hire. Torre Del Mar is half an hour away by car. 2 minutes Zafarraya. 10 minutes to the Mount Maroma natural park, you'll find a couple of restaurants at the entrance. 15minutes to the historic town of Alhama De Granada. Here you'll find historic buildings, a spectacular gorge, hot springs, turkish baths in caves and a bird reserve. 1 hour to Granada and the stunning Alhambra Palace. 30 minutes to Rio Frio if you like your fish fresh. 1 hour to El Torcal, a stunning geological site with views over the mediterranean. Zafarraya has supermarkets and banks,bars and resturants as well as a public swimming pool with bar that serves lite snacks, and a lovely play area for children with a bar. Alhama has a numerous cafes to choose from. The area is ideal for walking, cycling, painting, bird watching etc, we can arrange cycle hire and horse riding should you wish. We also live with in the 10 acre wood, we respect your privacy,but we are there if you require help and advice. All in all a stay at Narnia will give you a very relaxing holiday, weather you want to laze by the pool or be active, you only have to walk out of the front door. Booking Notes: We expect a 50% deposit on booking and the remainder a week prior to arrival. You can use Paypal or bank transfer. Changeover Day: If you could leave before 11am and arrive after 4pm it would help us but we are flexible. Changeover days are variable.